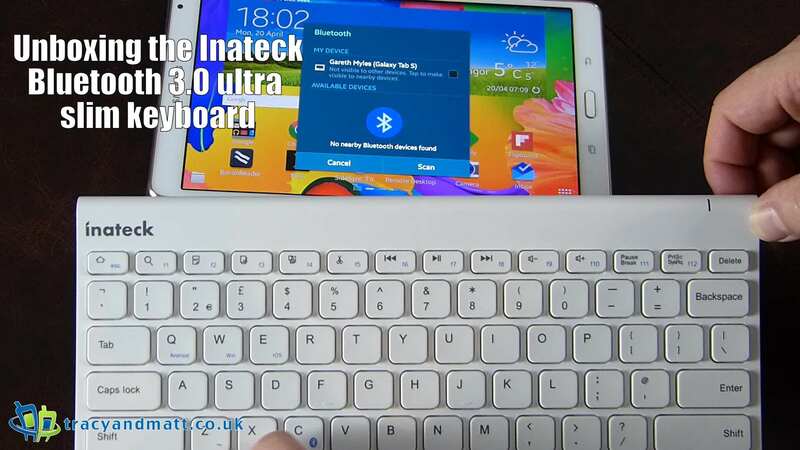 Coming in at an exceptionally low price whilst retaining a fine build quality the Inateck Bluetooth keyboard is a low cost solution to increasing comfort when travelling and the need for a more desktop like environment. Also available in black, this revised bluetooth keyboard is much more attractive than the typical affair you would expect at the low price of £23.99. A Curve-shaped and sleek design makes it portable and none bulky. A built-in 200mA lithium battery keep charge for up to 4 months in standby and 8 hours of continuous use every day. Keyboard sleeps after 10 minutes of inactivity and wakes up when any key is pressed. Compatible with Android, Windows, Mac OS/ iOS and all Bluetooth-enabled tablets, laptops, and computers, enabling you to mix and match with devices. 0.16inch (4.3mm) thin, easy to transport, work and play anywhere anytime. Built-in 200mA lithium battery, works for up to 4 months in standby without charging with 8 hours of continuous use every day; automatic sleep mode and smart wake up. Using the American broadcom Bluetooth 3.0 chip, transfer up to 24 Mb/s, 8 times more than the Bluetooth 2.0 standard, highspeed connection and signal distance up to 33ft (10m). You can purchase from Amazon here.